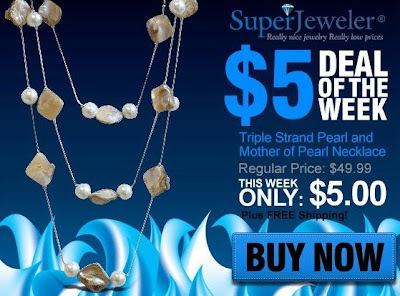 $5 for Triple Strand Pearl & Mother of Pearl Necklace + Free Shipping, Reg $49.99! While supplies last, you can get a Triple Strand Pearl & Mother of Pearl Necklace for the amazing price of $5.00 plus get free shipping! This is SuperJeweler's $5 Deal of the Week and regularly costs $49.99!